Wrexham rode their luck to beat 10-man Dagenham & Redbridge, climbing to third thanks to Craig Robson's late own goal. The home side had Kevin Lokko sent off on 32 minutes when he followed through in his tackle on Mark Carrington. Despite that, the Daggers had the ball in the Wrexham net twice through Michael Cheek and Mason Bloomfield only to be denied each time for off-side. But in time added on Robson got an unlucky last touch in a goalmouth scramble to hand Wrexham victory. "Full credit to the lads. They kept going and going. In the first half we played really well. In the first 20 minutes I thought we were exceptional. "The sending off, it changes games and if you score early your life becomes a lot easier, but they were outstanding when they went down to 10 men. "We had a little bit of luck and kept going and showed resilience, but weren't great with the ball." Match ends, Dagenham and Redbridge 0, Wrexham 1. Second Half ends, Dagenham and Redbridge 0, Wrexham 1. Own Goal by Craig Robson, Dagenham and Redbridge. Dagenham and Redbridge 0, Wrexham 1. Substitution, Wrexham. Scott Boden replaces Chris Holroyd. Substitution, Wrexham. Ntumba Massanka replaces Alex Reid. Substitution, Wrexham. Jack Mackreth replaces Mark Carrington. Kevin Roberts (Wrexham) is shown the yellow card for a bad foul. Marcus Kelly (Wrexham) is shown the yellow card for a bad foul. Second Half begins Dagenham and Redbridge 0, Wrexham 0. First Half ends, Dagenham and Redbridge 0, Wrexham 0. 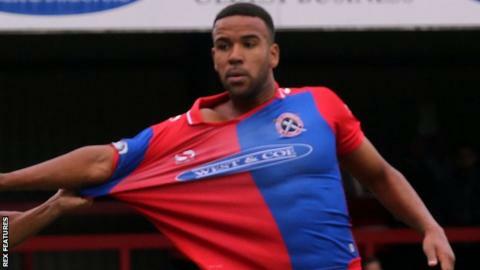 Kevin Lokko (Dagenham and Redbridge) is shown the red card.